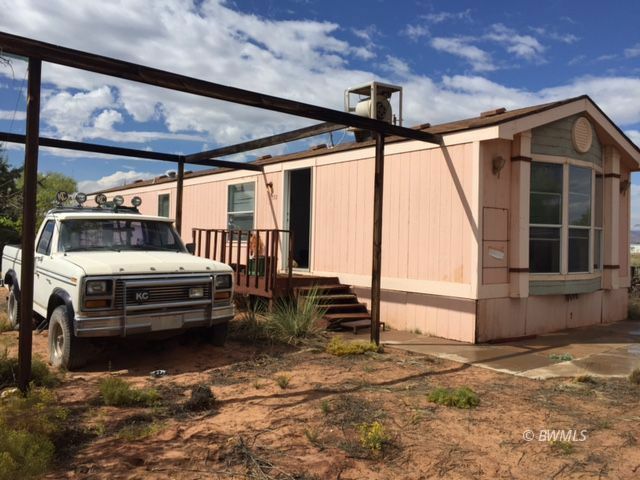 A 1995 992 SF singlewide mobile home has just been listed. There two bedrooms, two full bathrooms, living room, dining and kitchen. Perfect for a small family or for a vacation retreat home. It is located on a .33 acre corner lot. The lot has trees and other natural vegetation in place. The home has electric heat but also a great wood stove. There is an evaporative cooler for the summer but it isn't connected at this time. This home is located very close to the Grand Staircase Escalante area which is always a special treat to the eyes especially with the antelope playing at the end of the main road. You are only 15 minutes to Lone Rock Beach and about 25 minutes to the community of Page for your shopping needs. The water has been connected and there is a septic in place. Time to take a look and then be ready to place an offer.